Make your home or haunted house glow in that weird, haunting way. BLACKLIGHT 48-inch FIXTURE with BULB Lighting - Large Special Effects FX DJ Black Light 48-inch (122cm) long fixture with lamp bulb. Make your home or haunted house glow in a weird, haunting way with this Halloween Blacklight Fixture including replaceable Lamp Bulb. A generously sized light with a sturdy metal fixture. This Halloween Haunted House dance club party accessory provides 110 volts (USA voltage) of black light to will make white clothing and objects glow in the most cool spooky way imaginable! Ideal for use at Halloween, theatrical productions and more. 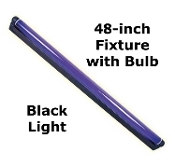 48 inch (122cm) black light with fixture. 110 volt 36 watt light bulb. current. With or without a transformer, this product is not recommended for use outside the US. However, we have many international buyers who have had no issues using our products with an adapter.